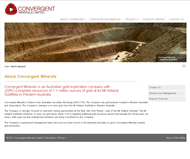 Convergent Minerals is a gold-focused company listed on the Australian Securities Exchange (ASX:CVG). 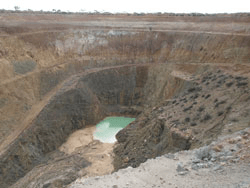 The Company’s intention is to mine gold from the Mt Holland Goldfield in Western Australia. 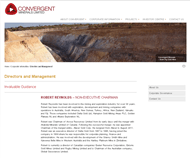 Convergent is strongly focused on near-term mining opportunities at the Blue Vein Gold Project, part of the Mt Holland Goldfield. 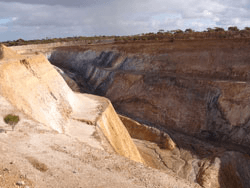 The Mt Holland Goldfield comprises 12 open cut gold mines, where CVG is targeting additional gold resources around and beneath the closed mines. All 12 gold mines are located within 10 kilometres of each other and represent a cluster of high grade gold deposits. The Blue Vein Gold Project, which is the first of 12 mines to be developed, has reached feasibility stage and permitting of gold production is in progress. The Company’s experienced management team has a proven track record of development and plans to grow Convergent Minerals towards gold production. The Mt Holland Goldfield is situated 300km east of Perth in Western Australia. 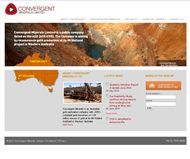 Convergent Minerals has 12 open cut gold mines and 2 underground gold mines, collectively making up the Mt Holland Goldfield. In excess of 1.5 million ounces of gold has been mined already from the Mt Holland Goldfield and significantly more gold remains. The Blue Vein Gold Project has been advanced to feasibility stage, with underground mining proposed, based on an initial 3.5 year mine life. A prefeasibility study completed in 2014 shows a positive cashflow of AUD $23m at the end of the first 3.5 years, with long term growth anticipated from depth and along strike. 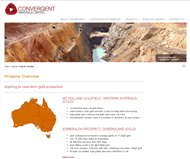 Convergent plans to develop each of the additional 11 gold mines sequentially. The Esmeralda Prospect is situated 58km southeast of the productive Croydon Goldfield in North Queensland. Convergent Minerals has more than 90 square kilometers under tenement, including the historical workings at Esmeralda. Early production records demonstrate an average mined grade of 17.29g/t gold at the time mining first commenced in 1894. Gold occurs in quartz veins traceable up to 600m long within the Esmeralda Granite. Gold, tin, silver, lead and copper have all been recorded as occurrences within the Esmeralda Granite. During 1992, Plutonic Resources collected 108 rock chip samples of the quartz veins at Esmeralda. Half the samples returned gold results more than 3.0g/t gold and 25 samples graded higher than 10g/t gold.